An article in the paper this weekend talks about fans of the "Twilight" book series visiting the town of Forks, where the series is set. 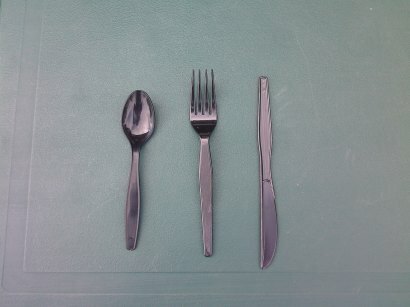 As the article points out, Stephenie Meyer chose Forks because it was reputed to be one of the rainiest places in the US. Storm clouds form over the Pacific and swoop inland, but collide with the Olympic Mountains; in the ensuing confrontation, the rain falls on Forks. Forks is also an interesting place to be a tourist attraction because it is fairly difficult to get to. As the saying goes, it's not the end of the world, but you can see it from here; it's near the westernmost point in the contiguous United States. The town is 100 miles west of Seattle, which, if you are not familiar with the geography of this part of the country, you might not even realize you can do. A check of your favorite mapping website reveals that the drive from Sea-Tac Airport to Forks is a 180-mile, four-hour trek (although much of it is quite scenic, and you get to cross the Hood Canal Bridge). I once drove through Forks on the way to the Hoh Rain Forest (which is definitely worth visiting) and recall it being a fairly uninspiring take on "former logging town". But of course that was before the vampires showed up. What, you might ask, is a four-dimensional user experience? Well, since you asked, I'll tell you. A four-dimensional user experience is one which incorporates time in its design (although to be honest I never quite got that "time is the fourth dimension" stuff). Here's an example of how a UX can benefit from taking time into account. When I open a file in Microsoft Word, the ribbon opens to the "Home" ribbon tab. If I have a different ribbon tab open when I save the file, it doesn't remember that fact; it opens back up with the "Home" tab visible. So now let's say I am sitting in the "Reference" tab, and I minimize the app, and come back to it 6 hours later. Which tab should be up? I vote for the "Home" tab; the fact that I had the "Reference" tab open 6 hours ago is ancient news, it's highly unlikely that I'm going to be continuing to do what I was doing back then, and I should be presented with the default view of Office. Similarly, if I choose "Save As..." and up pops the dialog box, that's great; but if I switch away from the app and come back the next day, do I really still remember or care about this? No, I don't. Dialog boxes should "expire" after a while (modal dialog boxes should be shot on sight, but that's another problem). Here's another one. Let's say I open a file, and the app makes one of those automatic changes that it has to apologize for (like Excel 'fessing up that the reason your file is considered changed is because it redid something in an Excel 2003 file). Now, if I exit the app right away, it should probably warn me that I haven't saved it. But if I wait three days and then exit the app, do I really care anymore? The answer is no, I really don't--a change three days ago that I didn't even make really isn't worth worrying about, so the UI should be aware of this and not bother prompting me to save the file. You get the idea. While others can worry about 3D user interfaces, you can jump right to 4D and impress all your friends! Remember, you heard it here first (unless you heard it somewhere else). Dave Niehaus, the Mariners play-by-play announced for their entire existence, was recently inducted into the Hall of Fame. Actually, it wasn't quite clear exactly what status he was being awarded. The newspaper (and the Mariners, in announcing a Dave Niehaus bobblehead next weekend) referred to him entering the Hall, but it didn't seem he could be going through the same door as Duke Snider and Satchel Paige; for one thing he's not retired, and for another, although he is a great announcer with a wonderful enthusiasm for the game and a central-casting voice, he's not THAT famous. Eventually a Wikipedia lookup revealed that Niehaus was actually winning the Ford C. Frick Award, which honors broadcasters. So it's a big fat honor and well-deserved, but he won't have a plaque next to Gary Carter and all those people. He does get a plaque in the library, and he also got to give a speech at the induction ceremony last weekend. His most famous call was Edgar Martinez's double to win the 1995 ALDS against the Yankees. Somewhat criminally, the audio on the MLB site remembering the 1995 season is the one from Brent Musberger--are they kidding?!? Luckily an obsessed fan has created a Ken Griffey, Jr. tribute site, and there you can find the call in all its Niehausian glory. Really it's not possible to listen to that and not get a huge smile on your face. A few weeks ago I got to experience one of those ridiculous email explosions due to people trying to remove themselves from a mysterious email alias by sending mail to the alias. The most famous of these in Microsoft history was probably the "Bedlam DL 3" one, which Larry Osterman blogged about. The most recent one was a bit more tame, since it involved a much smaller alias. "I find it quite amusing that so many people think that there exists a 'list of people to be removed from this list' somewhere, and that sending mail to everybody else in this list will somehow get their name added to said list, and getting their name added to said list will make it so they stop receiving all these emails. There must be some explanation for such behavior. Has this strategy worked for them in the past? Is there a psychological trick that makes people think this will work? If there is anybody out there who studies organizational behavior, I humbly suggest a study of this phenomenon." I too wonder what at the thought process behind somebody thinking you get off an alias by sending mail to the alias. Yes, there are certain mailing list systems where you send a coded message (like the word "unsubscribe" all by itself), but has there EVER been a system where the alias was monitored by a human being whose job it was to honor remove requests? I can only assume that such people are the type who view computers more like magic boxes than devices that can be mentally modeled, the ones who are unable to adjust when "My Documents" is renamed to "Documents". In such a world, being cursed with a pointless email thread is a punishment inflicted on you by unseen gods, and all you can do to stop the pain is to beg their forgiveness. Actually "beg" is a bit strong, particularly as the thread progresses and people being to lose their cool. The requests to be removed progressed from "Hi all- Apologies for the spam, but I believe I am on one of these DLs as a mistake" to "I am not sure why I am getting these emails-please remove me from the list" to "Get me off of this thing please" to "GET ME OFF THIS!!!!!!!!!!!!!!!!!!!!!!!!!!!!!!" to "PLEASE REMOVE ME FROM THIS LIST IMMEDIATELY!!!!!!!!!!!!!!!!!!!!!!!!!!!!!!!!!!!!!!!!!!!!!!!!!!!!!!!!!!!!!!!" (the gods evidently like it when you sacrifice some exclamation points). The author of the expert analysis I quoted above continued by proposing a theory based on class: "Of the emails I have not yet deleted, the senders are mostly vendors, hold non-technical positions, or both (though we’ve had a few senior PM types, too…). Perhaps they should receive some training." Leaving aside his incorrect jump to "it must be a knowledge gap" (which any student of the Six Boxes would recognize as shaky; like most situations, this is probably an expectations issue), I decided to look at the responses and see what badge color they emanated from. The "Get me off this thread" ones were 9 full-time and 25 vendors, while the "Stop reply all/here is how to remove yourself" were 16 full-time and 10 vendors. Which is some evidence that vendors are more prone to complete cluelessness, although the other kind of response isn't really much better (teeth-gritting silence is my favored approach). The replies from people asking people not to reply are also amusing. Some people are just blindly thinking that only they can save the world, and their tartly-phrased email is going to be the ONE that stops all the madness (emails like "Stop!!!!!" or "STOP HITTING REPLY ALL!!!!!!!!!!!!!!!!!!!!!!!!!!!!!!!!!!!!!!!!!!!!!!!!!!!!!!!!!!!!!!!!!!!!!!!!!!!!!!!!!!!!!!! "); but others obviously have to work through some mental anguish before finally deciding that the world does need one more reply all. This can range from the basics of pointing out the illogic of what people are doing ("Please do not reply all when you’re complaining about spam") to those that admit they are adding to the problem ("I am spamming you all for one last time. Isn’t this so stupid that some of you just feel the need to REPLY ALL to say not to REPLY ALL !!!!!!" or "I know I am spamming as well by replying all but please refrain from replying all and asking to be removed") to the ones that duck under the desk while clicking Send ("I hate myself for Replying All (just as I’m sure all of you do)..."). What is in the "Other" category I listed above? My favorite reply was "Please keep me on the lists; I love receiving these" (sent, appropriately, completely deadpan with no smileys of any kind). Somebody commented "I think this is a conspiracy to drive people insane...". Another emailer tried to make lemons out of lemonade by asking "I’m having fun, did everyone have a good holiday?" And finally, somebody resurrected an old email from Brian Valentine, in response to a previous outbreak of this sort, where he wrote "There are days I sit back in meetings after seeing people come up with great solutions to very hard problems and wonder how in the world we could be so lucky to have so many smart people working in this great company of ours...Then there are days where I see the below." "We collected about 7,900 tons of solid waste per year...We estimate that, by going to this program, solid waste will be reduced by 50 percent." 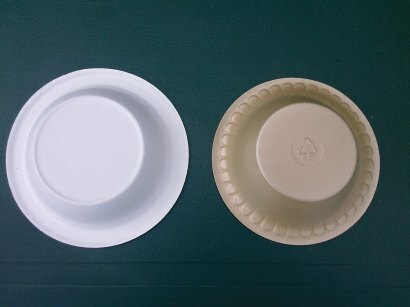 "Microsoft’s newfound demand for the eco-friendly cups, plates, and cutlery solidified an emerging market, giving a boost to the compostable tableware industry in the process." 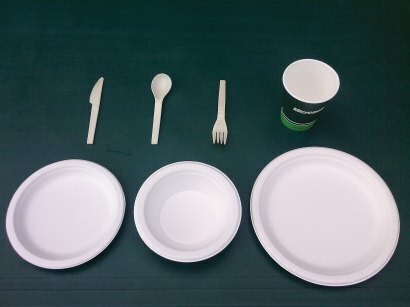 "We're causing a huge demand for products in the compostable cutlery industry as well as the paper cup industry...With the case of the cutlery, what we’ve found is that we actually doubled the market." Overall this looks like a great success. I particularly like the part where we alone doubled the market for starch cutlery; I expect to see Costco selling this stuff soon. There have been some complaints that it droops in hot liquid (although I tried an experiment, putting a spoon in hot water for 20 minutes, and saw no effect) and that some people with sensitive noses can detect a smell from the cutlery (which the manufacturer says goes away when they are exposed to air, and anyway they will remove the problem entirely soon). My favorite quote is in response to the question "How durable is this stuff? ": "It’ll get you through a meal, but, by design, it’s supposed to fall apart shortly after that...Also, make sure you don’t leave a cup full of coffee on your desk. If you do, you might find a mess when you get to work the next day." I have also heard people complain about this (the cups starting to biodegrade a bit sooner than desired) but at least it shows that the stuff works the way it is intended. Nowadays when I have lunch in the cafeteria I usually produce no trash: aluminum cans go into the recycling and everything else (napkins, plates, cutlery, and food scraps) goes into the composting. DOES NOT have a Wikipedia page. DOES have his own reality TV series. I know pretty much everybody is getting a reality show, but I would expect that Wikipedia could at least keep up, if not stay ahead, of that trend. Somewhat amusingly, here is an MTV article about Shwayze which even mentions "while he doesn't have his own Wikipedia page yet..."--although that was in May and he STILL doesn't have one. What is wrong with people?!? I notice that the Wikipedia page for the song itself was created a couple of days ago (and has already been defaced and fixed up once) so I suspect this shocking gap in the space/time continuum will be closed mighty quick. It's a small soccer goal with practice targets, but somehow it reminds me of something else...although the colors aren't quite in the right sequence. Microsoft recently changed how we recycle stuff. The minor point is that we got rid of separate aluminum and paper recycling containers and now we just throw it all in mixed recycling containers, which matches up with what homeowners in Redmond (like myself) do. 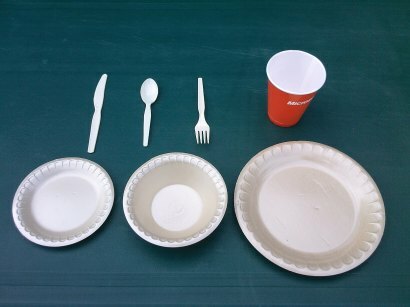 More interestingly, we replaced our polystyrene utensils and plates with compostable ones. The rumor was that the polystyrene was burnt to produce energy but it only returned 14% of the potential energy, or something. The new stuff, meanwhile, can be composted as yard waste, which is another option that Redmond homeowners have. As it happens, around the same time I was talking to somebody about composting at home and she mentioned that they used BioBags to hold their kitchen waste. She brought in a couple for me to try, and then I bought some of my own (they sell them at QFC). They are reasonably sturdy kitchen bags which are 100% compostable. So I hauled out an old garbage can with a lid on it, stuck it under the sink, and now we're trying to dump all of our food scraps (and paper plates and paper towels) in there. It looks like it will save us one or two bags of garbage each week (warning to anybody from Philadelphia: I use "trash" and "garbage" interchangeably). I looked around the Waste Management site for Redmond and found this page on yard waste collection which includes a link to a page on what can go in your yard waste bin (as far as I can tell this includes any food, including meat and nutshells, plus most paper products if too food-soiled to go in regular recycling). While we're on the subject, here is what can go in the recycling bin; surprises on the list for me included juice boxes, detergent bottles, vitamin jars, and cream cheese tubs. I also found a link that discusses the age-old question of whether it is better to put food waste into the garbage disposal or the trash (answer: in the trash, the sewage treatment system is in worse shape than the landfill system). Of course the best option is to compost them. Now that we have our BioBag-lined can set up, I can continue to work on my goal of not pre-washing the dishes, except now instead of scraping the extra stuff into the garbage disposal, I can scrape it into the compost. The Microsoft compost bins warn you only to throw Microsoft paper products into them, although from the Redmond site it looks like any uncoated plates are OK (although maybe uncoated plates are unusual). 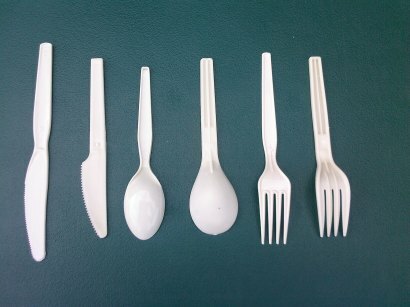 I do have one moral dilemma; if I know I am going to be using plastic utensils at home, is it appropriate to prepare ahead of time by helping myself to the compostable ones from Microsoft? This is one of my pet annoyances, and I recently experienced it again with this article in the New York Times about how Microsoft should start over with Windows. The author, Randall Stross, is no software industry neophyte; he wrote the book The Microsoft Way, so he spent some time studying the company. Nonetheless he makes some mistakes that betray some fundamental lack of knowledge about software. The first is when he says "Vista is the equivalent, at a minimum, of Windows version 12 — preceded by 1.0, 2.0, 3.0, 3.1, NT, 95, NT 4.0, 98, 2000, ME, XP." OK, I know we have sent out some muddled marketing messages, but do people really not realize that there are fundamentally TWO different versions of Windows--the Windows 3.0/3.1/95/98/ME one, and the Windows NT/2000/XP/Vista one? I know that even just counting the NT versions, Vista is the seventh version, but his description of Windows as "Beginning as a thin veneer for older software code" is (barely) a description of the other version, not the NT-based one. Then he claims "A monolithic operating system like Windows perpetuates an obsolete design." and mentions that "the company should take heart from Apple’s willingness to brave the wrath of its users when, in 2001, it introduced Mac OS X. It was based on a modern microkernel design, which runs a very small set of essential services that make the system less vulnerable to crashes." Doesn't he realize that we did exactly that--we switched from the old patched-together OS to the newer modern one, and dealt with compatibility issues, and people had to buy new versions of their apps to make them run faster, and all that stuff--and we did it in 2001 also? That's when the old Windows line, with Windows ME occupying the throne, was finally subsumed into the NT one. And I'm not sure what he means by "monolithic", but does he really think that Windows is some big windows.exe file or something? Windows and OS X are, to a couple of differentials, the same kind of OS, built with the same design, using the same technology. They both are a layered design and they both have various security exploits in their code. I know Stross isn't a kernel hacker, but it would be nice if he didn't fall into the easy "Mac OS X is architected in a fundamentally different or better way than Windows" sound bite. The ironic thing about my complaint (I know the term "ironic" is misused, but I think this is actual irony) is that I generally agree with Stross's overall point--Microsoft should think about replacing Windows. Windows may not reach back to 1983 or whatever as he implies, but the NT work is approaching 20 years old, which is just about how long the DOS-Windows 3.x line lasted. The goal should not to replace Windows with a layered microkernel design, because it already is that. And I don't think that writing an OS in managed code (which is what Singularity is) is necessarily the answer, although some of the tools they produced are useful, and I do love their approach: "What would a software platform look like if it was designed from scratch with the primary goal of dependability?" When I suggest to people at Microsoft that you could write an OS that is immune to security vulnerabilities, for some reason they all hear the question as "We could make a version of today's Windows that was free of security vulnerabilities" (which is of course NOT what I said) and they roll their eyes, and then when I explain that I mean starting over with that goal they patiently explain to me how new software will have more bugs than other software (which is another too-widely-accepted crock that I won't get into here), and then we all go back to hacking away on Windows 7.